Ripped after only using it twice!! These aren't ready for heavy duty abuse from my 275 pound carelessness, but they do look reliable and sturdy for normal use. Good eye catching color. I just like Summit Racing though. I might be a little biased. 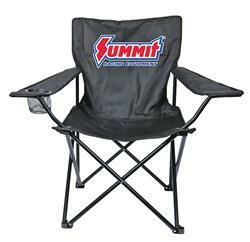 Great price for a folding chair, and it's bigger than most. Perfect for the Modern American (bigger than most).